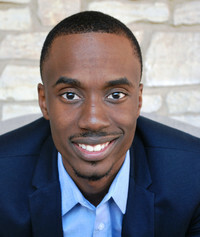 Marquis D. Harris is a Dallas, Texas native born January 4, 1993 to his parents Mary King (Robert King) and Eric Harris. Growing up, Marquis spent many years searching for purpose which led him to accept Christ in 2012 at the age of 19. Since then, he has been passionate about the work of the ministry. After spending years working with the set-up crew and media team, Marquis took his first full-time ministry position as the Executive Pastor at the Crossroads Church in Fort Worth, TX in 2015 under Pastors Sean and Lanette Reed. The following year, Marquis published his first book, Unrestrained & Unashamed: Breaking Into Your Purpose which challenges readers to break the chains of their past. While at a conference to promote his first book, Marquis met his now wife, Makayla Hancock-Harris. Since then, God has brought them together in ministry with the launch of The Shift, which equips teens to discover their God-given purpose, here at Crossroad Christian Fellowship under Pastors Glenn & Emma Hancock. Marquis strives to leave people enlightened, encouraged, and empowered to live a life devoted to Christ.